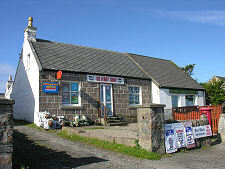 Fionnphort (pronounced finn-a-fort) is Mull's most westerly village and has a population of around 70, which doubles if you also take a scatter of smaller settlements at this end of the Ross of Mull into account. 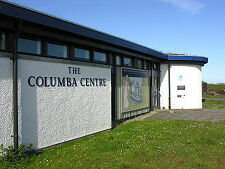 The name comes from the Gaelic for white harbour or white beaching place, doubtless a reference to the colour of the sand on the beaches in this part of Mull. 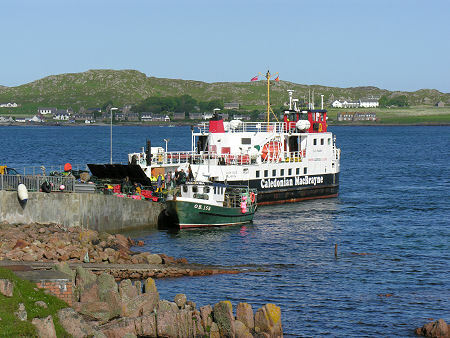 For centuries Fionnphort has been best known as the place where pilgrims and tourists heading to Iona start the last leg of the journey, by sea across the Sound of Iona. 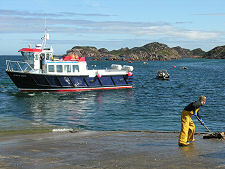 Today around 140,000 people each year board the Iona ferry here. Many also come to take boat trips to Staffa and Fingal's Cave, the Treshnish Isles, or simply to see the local sea life and birds. 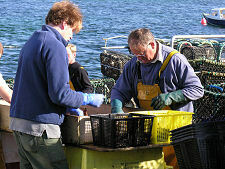 As a result the focus of much of the village's activity is its pier and slipway, where you find the ferry, the trip boats, and a number of locally based fishing boats. Much of Fionnphort is strung out along the single main road that comes in from the east en route to the ferry slipway. As it descends towards the slipway, its left hand side is lined by cottages, B&Bs, shops, the village pub and the coastguard station. 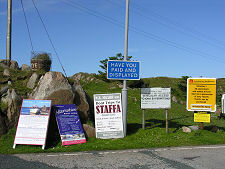 The right-hand side of the road has been widened to provide end-on parking spaces for visitors. Note that the parking here is pay and display. 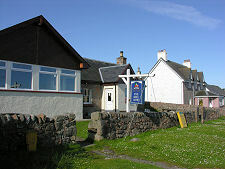 Those happy to park a five minute walk away from the ferry should look out for a side road on the left in the village. This leads to a free car park. Off to the right of the road approaching the ferry terminal the ground drops away. 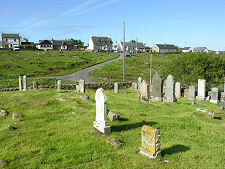 Here you find the village cemetery and a number of cottages, plus the head of a sandy bay which is home to an enormous granite boulder that has at some time split right down the middle. Fionnphort has long been known for the pinkish granite quarried just to the north of the village and for many years shipped out from here. 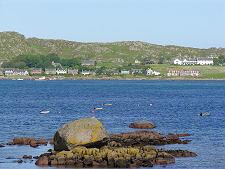 Notable buildings constructed with stone from Fionnphort include Iona Abbey, clearly visible from Fionnphort on the opposite side of the Sound if Iona, and the 48m high Skerryvore Lighthouse, built between 1839 and 1844 on an isolated and treacherous reef of rocks in open seas 25 miles west of here. 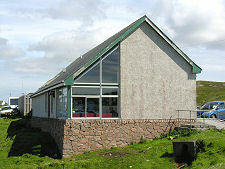 The building of Skerryvore was supervised by Alan Stevenson, one of the famous "Lighthouse Stevensons": the family into which the author Robert Louis Stevenson was born. Further afield, granite from Fionnphort also went into a number of buildings in London, including Blackfriars Bridge, the Albert Memorial, and Holborn Viaduct. 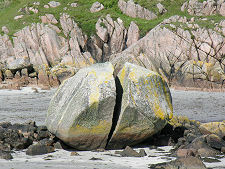 Robert Louis Stevenson has another connection with this end of the Ross of Mull. His novel, Kidnapped, was published in 1886 and revolves around a journey across Scotland undertaken in 1751 by the main characters, David Balfour and Alan Breck, much of it while being pursued by government troops. 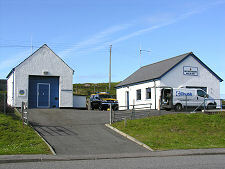 The starting point for the journey was the isle of Erraid, a tidal island two miles south of Fionnphort. In recent years various people, and Undiscovered Scotland, have become interested in the possibility of recreating a "Stevenson Way" starting in Erraid and crossing the south of Mull en route, eventually, to Edinburgh. 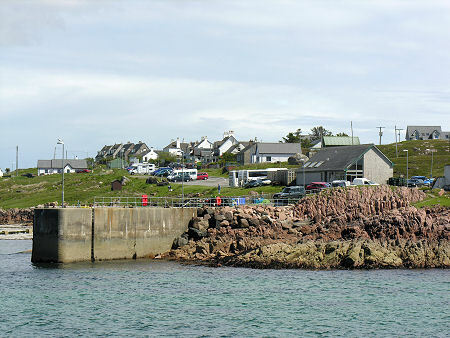 Fionnphort remains an active fishing port, especially for crabs, lobsters and shellfish. It is quite common to see these being sorted on the harbourside before being packed into lorries destined for France or Spain.